Unlike most battles, whether military or corporate, that you can read about in the history books, the battle between social media platforms is happening right now in front of our eyes. The battleground is very fluid, and could change at a moment's notice, but some platforms are in a much better position than others when it comes to certain aspects. Let's have a look at a few of the key points in this battle, with the help of our handy infographic. At the time of making this infographic, Facebook is way out in front of all the rest of the social media platforms, and that is not expected to change any time soon. With over 1.5 billion active users, Facebook is almost four times as popular as the platform in second place. Instagram and Twitter are in second and third place, with 400 million and 320 million actives users respectively. LinkedIn and Pinterest come in at fourth and fifth – both with 100 million active users. While these counts of total active users are important to know, there are some other factors that can be very important. For example, if you are looking for a certain type of person to market to, such as an age group or gender, then you will have to look deeper than total active users. Luckily for you, we are about to get in to that next, with the help of our handy infographic. So, you have a product that you think will do well with either men or women, but not neccessarily both, so what do you do? Where do you focus your social media marketing efforts to be more successful? Well, we have some stats on that too. The social media platform with the most even mix of men and women at the moment is Twitter. This platform has 47% men and 57% women. Instagram is the platform with the largest disparity between male and female users. Out of all of the active users on this platform, 65% are female and only 35% are male. Facebook, YouTube, and LinkedIn all have a fairly even mix between male and female users, but not as evenly mixed as Twitter. For example, Facebook has slightly more female users, while YouTube and LinkedIn have slightly more male users. Again, as with the gender issue, some social media platforms are better than others when your focus is on generating leads and making sales. It should not be a surprise that Facebook is the leader out of all of the platforms in terms of its influence on purchases, because this platform is also the biggest by far. The surprising part comes when you look at Twitter. Despite being a very popular platform – over 320 million active users – it is ranked last when it comes to influencing purchase decisions of its users. Google Plus is actually almost three times more likely to influence a purchase decision when compared to Twitter. YouTube comes in second to Facebook, which is also not much of a surprise since this platform lends itself more toward showing off a product and what it can do. There is only so much that a picture and text on another platform can say about certain products, while a video on YouTube is much more likely to give people a better idea of what it is that you're trying to sell. The percentage of people who login to their social media account every day is a great statistic that shows how much importantance they feel each platform has in their life. If you are going somewhere every day, or even more than once per day, then you probably enjoy it or depend on it more than other platforms. 70% of Facebook users visit their page every day, which makes it the most actively used out of all social media platforms. As far as the other big platforms are concerned, Instagram comes in second place with 59% of its users logging in every day. Twitter is third with only 38%. LinkedIn and Pinterest are fourth and fifth with 27% and 22% respectively. These stats, along with total time spent on each platform per day, make up some of the most important information for advertisers as well as the executives of each social media company who want to make their products the best they can be. After all, if someone is spending an hour on Facebook and only fifteen minutes on Twitter, for example, it is clear which one will command higher prices for advertising. So, now that you have a little more information to go on, you should take a look at the infographic to see more of a complete picture. 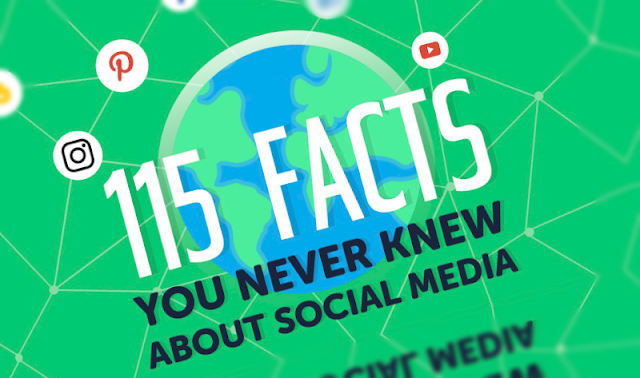 If you are serious about getting to know the ins and outs of each platform, whether for marketing purposes or something else, then you should find these facts and stats very interesting and hopefully profitable. I'm a Ukrainian linguist and content marketer. Write about everything that can draw my attention. Love traveling and cooking. Say hi at @AlionaTarankova.